Live dealer table games are officially available in the state of New Jersey. Currently, Golden Nugget Casino online and Betfair are the only casinos to offer this innovative new form of online gambling. Live dealer blackjack is a truly interactive experience; you can even chat with your dealer and other players at the table while you play. You make decisions from your device and the dealer’s responses and the outcome of games are streamed live. Unlike Baccarat and Roulette, your decisions while playing blackjack have a huge impact on how well you’ll do – this can be a negative for some, but most players love being a bigger part of determining their own fate. Side bets Perfect Pairs which pays when the player's first two cards are a pair, and 21+3 which pays based on the poker hand quality of your first two cards and the dealer's up card. Live dealer blackjack is the same version of the classic game of 21 that any casino frequenter would recognize, except you can play without leaving your living room. Online gaming company Ezugi partnered with the Golden Nugget to provide the technology for live dealer online games to take place, and the New Jersey Division of Gaming Enforcement approved the security and game integrity of the system. Once a player has entered the live dealer lobby, they have the option of choosing what table and seat to occupy. Bets are then placed by the player on a virtual board in front of a real human being; this is just like placing a bet in a traditional casino. Similar to online poker, hands have a timer to ensure players place their bets efficiently. While playing live dealer blackjack, occasional errors can occur – the internet can disconnect, or a dealer might make a mistake. If the error is on the dealer’s side, a floor manager will review and solve the problem at hand as they would in a physical casino. A slow internet connection can interfere with the quality and speed of gameplay, and it’s recommended to play on a reliable connection to avoid those errors. If errors related to technology take place, the game will be halted until the problem is resolved. If the error is an internet disconnection, the resolution varies depending on how long you’re disconnected for and how easy it is to continue without the player in a fair way. Online casinos which receive regulator approvals to run live dealer games, including Golden Nugget NJ, are prepared for these situations. There is rarely an issue that can’t be solved in a way that players find fair. While playing live dealer blackjack players can stand, hit, double down, or split just like in a live casino. Players can also buy insurance on their bets, or surrender when the rules allow. The eight decks of cards are always cut in the middle, and the dealer will always shuffle the cards at the end of the round. Since you are playing against a real human dealer instead of a computer, side bets are allowed. Any of the following variations of perfect pairs pay out side bets at Golden Nugget. Another side bet that is commonly seen on a casino floor and is available at Golden Nugget online is 21 + 3. The outcome of this bet is determined when the players first two cards and the dealers burn card are shown. Five different card combinations pay out a side bet in 21 +3; suited trips, straight flush, three of a kind, straight, and flush all pay out in live dealer blackjack. 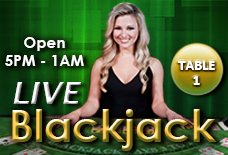 Live dealer blackjack has a return to player (RTP) percentage of 99% for perfect play blackjack, 95.91% for a perfect pair, and 93.72% for 21 +3.